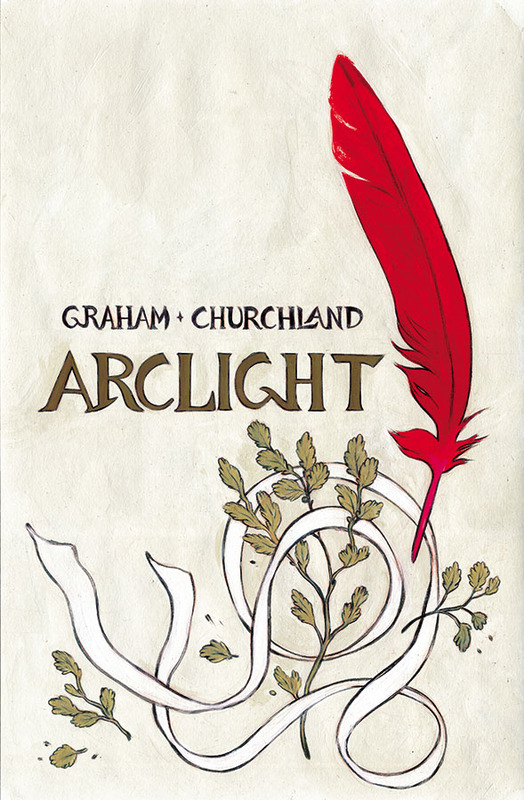 Arclight is the story of a young noble woman, Lady Kanga, and the strange entity that takes over her physical body. The actual Lady Kanga is trapped inside the body of a monster, and lives on the outskirts of the kingdom. Alone and exiled, she is visited by her loyal companion, a knight named Arclight, and together they must fight the darkness that has taken over her real body. At the beginning of the book, we are transported to a mysterious kingdom full of magic, monsters and flying palaces made of bone. We don’t really know much about the kingdom, or the threats that exists in it. That changes as the story progresses. We are introduced to the inhabitants of the kingdom, and told the story of what happened to Lady Kanga. We get a glimpse of the entity that has taken over the body of Lady Kanga, and where the real threat lies. There is a lot of emphasis on the world they created. The artwork is whimsical and simple, and it represents it perfectly. There are smart, interesting characters who live in this world. Unfortunately, the story never feels fleshed out. It’s a slow burn through out, that never relies on exposition to tell the story, it lets the characters do that. The story never feels that important though, because the world they inhabit takes the spotlight. Arclight takes a while to get going, but once it does, it fizzles.